Intracranial pressure (ICP) monitors are devices that measure ICP and are generally placed in any patient in whom there is concern for elevated ICP. ICP bolt with ports for ICP and pO2 monitoring. Ventricular drainage system with adjustable drip chamber for collecting CSF. Diagram illustrating ventricular drainage system. Monitors that detect changes in pressure on the basis of flow through a fluid-filled system are most accurate when the system is closed to drainage. The combination of a ventriculostomy with a closed drainage system is also known as an external ventricular drain (EVD). Bolts commonly use fiberoptic technology that allows continuous ICP monitoring without CSF drainage. The fiberoptic type of catheter can be placed in the subdural space or in the brain parenchyma, whereas the EVD is not accurate unless it is located in the intraventricular space. The Integra Neuroscience external drainage catheter is a CSF diversion device that also measures ICP. The catheter tubing is translucent with depth markings and contains a radiopaque barium sulfite strip. 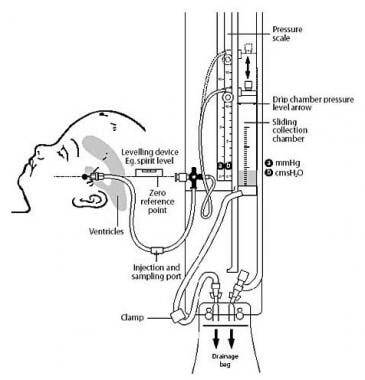 ICP readings are based on a fluid-filled transduction system that transmits changes in ICP through a saline-filled tube to a diaphragm on a strain-gauge transducer. [1, 2, 3] This monitor must be leveled with the foramen of Monro (approximately the level of the external auditory canal) after insertion and should be zero-balanced daily. The level of the drain can be adjusted to allow more or less CSF drainage. The Codman Microsensor catheter can be used as an intraparenchymal or intraventricular monitor, depending on the depth of the catheter. Different drill bits are used to allow for variable depths of measurement. If used as an intraventricular monitor, the catheter also allows CSF drainage. The Codman Bactiseal external ventricular drain catheter, similar to the Integra Neuroscience external drainage catheter, is a CSF diversion device that also measures ICP. During manufacture, the silicone catheter is impregnated wth two antibiotics, rifampin and clindamycin, to fight against gram-positive bacteria. Over the course of 28 days, the antibiotics are slowly released. The advent of this product challenges the use of standard catheters in the neurocritical care setting. Spiegelberg ICP monitors measure ICP through an air-pouch system attached to a pressure transducer connected to an electronic device. The probes differ, depending on where they rest. The epidural probes air pouch rests on the dura. The risk of infection is minimal for these probes. ICP monitoring is routinely used to direct medical and surgical therapy in patients with acute brain injury, particularly those with Glasgow Coma Scale (GCS) scores of 8 or lower. Normal ICP is less than 20-25 mm Hg, and sustained pressures in the range of 20-30 mm Hg are associated with a poor prognosis. ICP monitoring facilitates therapy to maintain adequate blood perfusion in traumatic brain injury (TBI), minimizing secondary injury. The secondary injury in TBI is a cascade of inflammatory response that can increase edema and affect blood perfusion, with the consequence that the brain injury may be worsened. About 50% of patients with severe TBI and abnormal computed tomography (CT) scans have an elevated ICP. Accordingly, Brain Trauma Foundation (BTF) guidelines recommend ICP monitor placement in any patient with a severe head injury who has an abnormal CT scan. These patients are defined as having a Glasgow Coma Scale (GCS) score of 3-8 after adequate cardiopulmonary resuscitation. Abnormal CT scan findings include hematomas, contusions, and generalized edema. Although these nonrandomized series are prone to bias, the contention that ICP monitoring can guide management and may improve outcomes among patients who suffer severe closed head injuries has been noted. In a study comparing fiberoptic intraparenchymal monitors with external ventriculostomies in 62 children, Exo et al  found a high correlation between the two devices but noted that some readings were delayed with the EVD because it must be closed for accurate determination of ICP. They recommended placing both an intraparenchymal ICP monitor and an EVD to allow continuous ICP measurements and drainage of CSF. Weinstabl et al  compared the Gaeltec epidural ICP monitor with the Camino subdural ICP monitor in vitro using a tightly closed fluid-filled box to represent the skull and confirmed their findings clinically in 10 patients. In the clinical setting, a minimal difference in ICP readings was found between the two types of monitors; however, the study did find that the Gaeltec epidural monitor had higher readings when the ICP measured more than 20 mm Hg. The Camino subdural monitor malfunctioned more often frequently and was found to have a greater zero-drift. Martinez-Manas et al  prospectively analyzed 180 Camino fiberoptic pressure monitors (intraparenchymal, subdural, and intraventricular) to determine their accuracy and their associated complication rates. The most common complications were infection (13.2%) and hemorrhage (2.1% in patients without a coagulopathy vs 15.3% in patients with a coagulopathy). Infections occurred more often in monitors that were kept longer than 10 days. 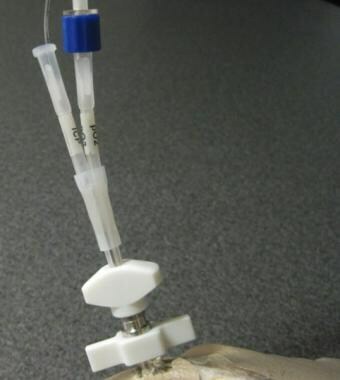 Of the 56 catheters that were analyzed for zero-drift, 60.7% of the probes were within the manufacturer’s specifications. Poca et al  also prospectively analyzed the Camino intraparenchymal monitor in 163 head-injured patients and found that none of their patients developed an infection. Of these devices, 12.8% had a technical malfunction such as lead fracture, 63.5% overreported the ICP, 11.1% showed no drift, and 25.4% underreported the ICP on the basis of postremoval analysis. They did not find a correlation between the length of time the monitor was in place and the amount of zero-drift. Piper et al  assessed the accuracy of the Camino ICP monitor and also found a 10% malfunction rate. Zero-drift was found in 50% of patients, but only 6% had a drift exceeding 3 mm Hg. Like Poca et al, they did not find a correlation between duration of monitoring and zero-drift. Fernandes et al  analyzed the Codman Microsensor ICP monitor by comparing it to the Camino ICP monitor in eight patients with head trauma or intracranial hemorrhage (ICH). One monitor of each type mechanically failed. The Codman Microsensor monitor drifted in comparison to the Camino ICP monitor in two cases, once in the positive direction and once in the negative. Overall, the Codman microsensor reading were higher by 5 mm Hg in 24% of the patients and by 10 mm Hg in 9% of patients; however, owing to the small sample size, further device studies would be needed to accurately compare the two monitors. Al-Tamini et al  assessed the zero-drift of Codman ICP monitors in 88 ICU patients. The median zero-drift was 2 mm Hg, with a drift of 5 mm Hg in 20% and 10 mm Hg in 2%. The area around the incision is clipped and cleaned. With sterile technique, the scalp is incised, and a small hole is drilled through the skull. The ICP monitor is inserted through this hole and passed to various depths depending on the type of monitor being used. The Camino postcraniotomy subdural monitor is usually inserted intraoperatively, with one of the craniotomy bur holes serving as the insertion point. These monitors can be left in place for several days. Integra recommends replacing the Camino fiberoptic monitors after about 5 days to ensure accurate ICP readings. ICP monitors can easily be removed at the bedside, and the entry point is closed with sutures to prevent CSF leaks. Accurate placement of the ICP monitors is usually assessed by means of CT of the head. CSF can be routinely checked for meningitis in patients with external ventriculostomies, but not with fiberoptic monitors. The major complications associated with all ICP monitors include infection and hemorrhage. Despite the use of sterile technique during insertion, there is a risk of meningitis and wound infection, which ranges from 1% to 27% and is higher with external ventriculostomy insertion. [19, 1, 28, 29] Fiberoptic monitors have a lower risk of infection, ranging from 0% to 1.7%. Most infections are caused by gram-positive organisms such as Staphylococcus species. Technical malfunction can lead to inaccurate readings and occurs with both fiberoptic and strain-gauge monitors. Fiberoptic transducers can be damaged by excessive kinking or bending, which may affect their accuracy and function. Additionally, these monitors are subject to zero-drift, which can be significant [31, 26, 30, 2] and may result in inappropriate ICP management. EVDs can become occluded with brain tissue or blood clot and also must be zero-balanced on a regular basis to ensure accuracy. These monitors have been found to drift by ±2 mm Hg every 8 hours. EVDs are typically re-zeroed whenever the drain height is adjusted, the patient is moved, or the reading does not seem to correlate with the patient’s clinical status. Lavinio A, Menon DK. Intracranial pressure: why we monitor it, how to monitor it, what to do with the number and what's the future?. Curr Opin Anaesthesiol. 2011 Apr. 24 (2):117-23. [Medline]. Piper I, Barnes A, Smith D, Dunn L. The Camino intracranial pressure sensor: is it optimal technology? An internal audit with a review of current intracranial pressure monitoring technologies. Neurosurgery. 2001 Nov. 49(5):1158-64; discussion 1164-5. [Medline]. External Drainage Catheters [package insert]. Integra Neurosciences. 2018. Ventrix Ventricular Tunneling Pressure Monitoring Kit [package insert]. Integra Neurosciences. 1998. Micro Ventricular Bolt Pressure Monitoring Kit [package insert]. Integra Neurosciences Camino. 1998. March K. Intracranial pressure monitoring: why monitor?. AACN Clin Issues. 2005 Oct-Dec. 16(4):456-75. [Medline]. Bhatia A, Gupta AK. Neuromonitoring in the intensive care unit. I. Intracranial pressure and cerebral blood flow monitoring. Intensive Care Med. 2007 Jul. 33(7):1263-71. [Medline]. Camino Intracranial Pressure Monitoring Catheter with Licox Bolt Fitting [package insert]. Integra Neurosciences Camino. 2003. OLM Intracranial Pressure Monitoring Kit [package insert]. Integra Neurosciences Camino. 1998. Post Craniotomy Subdural Pressure Monitoring Kit [package insert]. Integra Neurosciences Camino. 1998. Codman ICP Monitoring System. [package insert]. Available at [Full Text]. Gaeltec ICP Transducers. [package insert]. Available at [Full Text]. Bactiseal Antimicrobial Impregnated Catheters. Antimicrobial Impregnated Catheters. Available at http://synthes.vo.llnwd.net/o16/LLNWMB8/US%20Mobile/Synthes%20North%20America/Product%20Support%20Materials/Catalogs/Bactiseal%20Product%20Catalog%20VAL-82-000.pdf. 2018; Accessed: January 22, 2019. Weinstabl C, Richling B, Plainer B, Czech T, Spiss CK. Comparative analysis between epidural (Gaeltec) and subdural (Camino) intracranial pressure probes. J Clin Monit. 1992 Apr. 8(2):116-20. [Medline]. Ventricular probes. Spiegelberg GmbH & Co. KG. Available at http://www.spiegelberg.de/products/icp/ventricular.html. 2016; Accessed: January 22, 2019. Bogdahn U, Lau W, Hassel W, Gunreben G, Mertens HG, Brawanski A. Continuous-pressure controlled, external ventricular drainage for treatment of acute hydrocephalus--evaluation of risk factors. Neurosurgery. 1992 Nov. 31(5):898-903; discussion 903-4. [Medline]. Ostrup RC, Luerssen TG, Marshall LF, Zornow MH. Continuous monitoring of intracranial pressure with a miniaturized fiberoptic device. J Neurosurg. 1987 Aug. 67(2):206-9. [Medline]. Saul TG, Ducker TB. Effect of intracranial pressure monitoring and aggressive treatment on mortality in severe head injury. J Neurosurg. 1982 Apr. 56(4):498-503. [Medline]. Eddy VA, Vitsky JL, Rutherford EJ, Morris JA Jr. Aggressive use of ICP monitoring is safe and alters patient care. Am Surg. 1995 Jan. 61(1):24-9. [Medline]. Lane PL, Skoretz TG, Doig G, Girotti MJ. Intracranial pressure monitoring and outcomes after traumatic brain injury. Can J Surg. 2000 Dec. 43(6):442-8. [Medline]. Le Roux P, Menon DK, Citerio G, Vespa P, Bader MK, Brophy GM, et al. Consensus summary statement of the International Multidisciplinary Consensus Conference on Multimodality Monitoring in Neurocritical Care : a statement for healthcare professionals from the Neurocritical Care Society and the European Society of Intensive Care Medicine. Intensive Care Med. 2014 Sep. 40 (9):1189-209. [Medline]. The Brain Trauma Foundation. The American Association of Neurological Surgeons. The Joint Section on Neurotrauma and Critical Care. Indications for intracranial pressure monitoring. J Neurotrauma. 2000 Jun-Jul. 17(6-7):479-91. [Medline]. Talving P, Karamanos E, Teixeira PG, Skiada D, Lam L, Belzberg H, et al. Intracranial pressure monitoring in severe head injury: compliance with Brain Trauma Foundation guidelines and effect on outcomes: a prospective study. J Neurosurg. 2013 Nov. 119(5):1248-54. [Medline]. Chesnut RM, Temkin N, Carney N, Dikmen S, Rondina C, Videtta W. A trial of intracranial-pressure monitoring in traumatic brain injury. N Engl J Med. 2012 Dec 27. 367(26):2471-81. [Medline]. Shafi S, Diaz-Arrastia R, Madden C, Gentilello L. Intracranial pressure monitoring in brain-injured patients is associated with worsening of survival. J Trauma. 2008 Feb. 64(2):335-40. [Medline]. Schickner DJ, Young RF. Intracranial pressure monitoring: fiberoptic monitor compared with the ventricular catheter. Surg Neurol. 1992 Apr. 37(4):251-4. [Medline]. Exo J, Kochanek PM, Adelson PD, Greene S, Clark RS, Bayir H, et al. Intracranial pressure-monitoring systems in children with traumatic brain injury: combining therapeutic and diagnostic tools. Pediatr Crit Care Med. 2011 Sep. 12 (5):560-5. [Medline]. [Full Text]. Martinez-Manas RM, Santamarta D, de Campos JM, Ferrer E. Camino intracranial pressure monitor: prospective study of accuracy and complications. J Neurol Neurosurg Psychiatry. 2000 Jul. 69(1):82-6. [Medline]. [Full Text]. Poca MA, Sahuquillo J, Arribas M, Baguena M, Amoros S, Rubio E. Fiberoptic intraparenchymal brain pressure monitoring with the Camino V420 monitor: reflections on our experience in 163 severely head-injured patients. J Neurotrauma. 2002 Apr. 19(4):439-48. [Medline]. Fernandes HM, Bingham K, Chambers IR, Mendelow AD. Clinical evaluation of the Codman microsensor intracranial pressure monitoring system. Acta Neurochir Suppl. 1998. 71:44-6. [Medline]. Al-Tamimi YZ, Helmy A, Bavetta S, Price SJ. Assessment of zero drift in the Codman intracranial pressure monitor: a study from 2 neurointensive care units. Neurosurgery. 2009 Jan. 64(1):94-8; discussion 98-9. [Medline]. Kakarla UK, Kim LJ, Chang SW, Theodore N, Spetzler RF. Safety and accuracy of bedside external ventricular drain placement. Neurosurgery. 2008 Jul. 63 (1 Suppl 1):ONS162-6; discussion ONS166-7. [Medline].